In the latest installment of this hit franchise, travel across the fantastic plane of Shandalar as you face encounters, and battle powerful Planeswalkers. Magic 2013 offers new features including statistics-tracking for your game play and, for those already skilled in slinging spells, the option to choose what lands to tap when you cast your spells. In addition to Xbox 360, PlayStation 3, and PC, Duels 2013 is also available on the iPad! 18 additional Campaign levels across the planes of Ravnica, Alara, and Innistrad, plus 11 revenge matches and 3 Planechase battles. I’m new to Magic (the actual game) and as such have found the rules confusing at times. This digital version is great for learning the mechanics and, as stated by some of the other reviewers, has some well themed decks. There are several modes available, but I mostly play custom games against the AI. Upon winning a game cards are unlocked for the deck you choose to play with – therefore you increase the options available for each deck. All in it’s a pretty good App to have on a tablet – although I would like the cards to appear larger when they’re laid (I have to keep zooming in on them to see what they say) – although this could be a symptom of playing on a small screen tablet with a high resolution (Nexus 7). This game would be amazing if the deck building was open to any cards you cared to have – you could then build and test decks before investing in the purchase of real decks to find they’re sub-optimal. If you’re new to Magic – get the this and learn the game in the best way – by playing. If you’re a veteran Magic player you’ll be disappointed with the limited deck building options. Magic the Gathering was the first and (still) is the greatest collectible card game ever made. The mechanics are so simple and yet the possible strategies are so deep that it offers a fantastic experience for both newcomers and veterans alike. Now we have the third digital iteration of the venerable card game and I must sa, the third time is the charm. Now, let’s find out if MTG: Duels of the Planeswalkers 2013 was Worth It. I downloaded my copy for PS3 from the PSN Store for $10. The game comes packed with more cards than either of the previous editions and the new decks are loaded with both new additions from the 2013 Core Set and some old fan favorites. The game includes: 10 new decks (each with 60 cards plus 30 unlockable cards), the new Planechase mode, new puzzle challenges, a new campaign, and multiplayer. Duels 2013 comes with all the essential components that all MTG fans want. The new cards look great and it’s awesome they included some of the best cards from 2012. Now that each deck has 30 more cards to unlock, you will be playing this game for a long time. If you have never played MTG before have no fear! The tutorial level is clear, concise, and voiced over. I played through it just as a refresher. There are also 3 difficulty levels for players new and old. Magic the Gathering is, at its core, a simple game. The objective is to bring your opponents life points down to 0. You do that by dealing damage to them with creatures that you summon and spells that you cast. All of the creatures and spells are played from your hand and all cost Mana. Mana is your resource and you add Mana to your Mana Pool in order to cast more powerful spells. During the game each player will have an array of creatures, enchantments, and other spells out in front of them trying to maneuver around their opponent. The turn is simple. First, draw a card. Second, play a Mana card if you are able. Third cast spells by paying the Mana Cost. Forth, attack your opponent. Then it is the other players turn. The game ends when one player has 0 life remaining. It may sound easy, at it is, but there is more strategy involved than you may think. The game play is deep and each deck plays very differently. 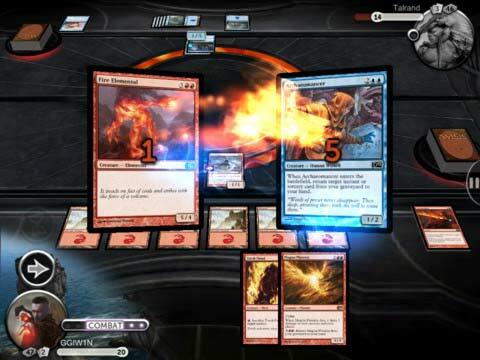 It’s MTG – Duels of the Planeswalkers 2013 is a no frills port of the classic card game onto a digital platform, and it WORKS. The game is played in the exact same way as you would if it was the physical card game, just how I like it. The Art – Because this is MTG after all, you know the art will be amazing. And, it is. From the cards to the loading screens, WotC used some the best looking cards out there. Unlocking Cards – Each time you win a battle you unlock a new card for the deck you used. Each deck has 30 cards to unlock. This feature ensure that players will try out decks to get a feel for them and sick with one to unlock the best cards, it’s just like collecting. Also each deck can be customized to fit your style of play. So not only is each deck different you could play the same deck in two VERY different ways depending on your choice of cards. A $10 CCG – Collectable Card Games are notorious for breaking the bank. Each pack for 15 MTG cards costs $3.99, for me, that adds up REAL quick. So being able to pay $10 for a game that includes all the aspects of collecting and customizing that I look for in a physical card game is a true winner. 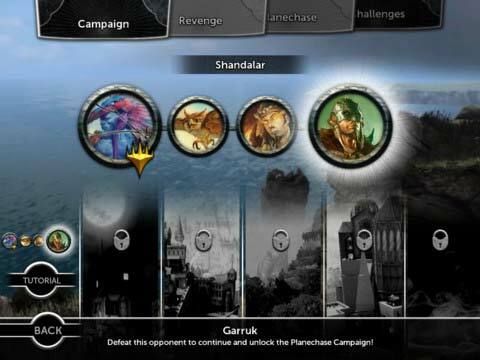 Online – Planeswalkers features some robust AI and many different challenges against the computer but the game shines when you venture online to test your will against another player. It is always reward to use your favorite cards to grind someone into the dust and it is fascinating to see the strategies that other’s have come up with. Also, 2v2 team battles are the best part of the game. You must coordinate strategy and work with your teammate to ensure victory in the vicious online games. Planechase – The new gamemode, Planechase is a bust. It’s bizarre and includes an “event deck” of strange game modifies that effect all players. Planechase is won on luck more than skill and it is a waste of time. The Controls – Like the other two versions of Duels, the controls are cumbersome and finicky. Why you cannot use the D-Pad to select cards I will never know. Luckily this is not bad to the point of breaking the game but it sure is annoying when bad controls force you to miss-select a card and make a bad play. Not True Customization – Although you have a lot of options when customizing your deck it would be fantastic if the game offered a deeper experience. The ability to choose how many Mana cards to include in the deck for one and the option to trade cards from one deck to another would add a whole new level of pre-game strategy. Had fun playing on my 360, but soon as it freezes in one of the section and continually doing it at the same section play-ability went down the tubes. I too totally agree with all the points that Andrew Verticchio has to say about it (http://boardgaming.com/author/doctordhgames). Still enjoy the card game over the digital form. Magic the gathering is the first TCG i played that i started to collect and really tried to get good at and now that i have played for several years i am okey at the game. i first played MTG duel of the planeswalkers on my PC and i loved it and i thought that this is a good way to learn more and now i have spent to much time with it, or so my girlfriend says. although i lie the physical copies better i really like the digital game as well. it’s a good way to learn and to get to know the game better and in your own speed. I downloaded this and was extremely excited to play Magic. It does not disappoint. It’s a blast using all the different decks against opponents in the campaign. Winning cards and decks…playing the challenge stages…and of course the online play. I was happy to spend the ten bucks on this. It also got my ten year old playing Magic and…because of him playing this on the iPad…he wanted to get real cards to play. I am loving it. Thank you Richard Garfield…it’s good to be back. I love that I can play my magic at anytime. I totally agree with all the points that Andrew Verticchio has to say about it (http://boardgaming.com/author/doctordhgames). I have been seen playing this at many a FNM’s in between match’s. Just can’t get enough MTG. The cost is really low for what you get and for people that love MTG and don’t have the money to go out and buy the cards this is your chance to give them a whirl…over and over again. For those who have played Magic before, the Duels of the Planewalkers series strips the Magic experience down to its core, with a real emphasis on the mechanics and strategy of gameplay. In that respect it is as fun as any game of Magic you will ever find. The deckbuilding mechanic is severely curtailed when compared to the CCG or Magic Online. This is one of my favorite aspects of Magic, and I was hoping for more out of this version. This looks like it would be a great game and some of the intro levels certainly are enticing. The big killer and the reason for my rotten review is that when you attempt to play campaign mode on an original iPad it crashes about a turn into it. I’ve rebooted, removed all running apps, everything you would normally do. It just doesn’t work on the original iPad. Now I should note that they do recommend an iPad2 or higher for this game, but they don’t say it doesn’t work on an original iPad. Perhaps I’m being too harsh, but without a way to resume a crashed game (they just disappear as if you never started it) and no way to actually finish a game, it makes for a very unhappy player. its like you are playing at the table. in fact you can! i would recomend buying an ipad just to play this game, its games like this that the ipad was invented, I hope more board/card games follow suit! 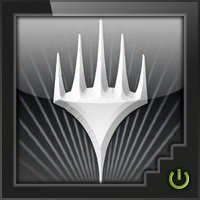 Add a Review for "Magic: The Gathering – Duels of the Planeswalkers 2013"
Online one-on-one Multiplayer, In-App Purchases and more.